Council meetings are held at 7.30pm on the Tuesday following the 1st Monday of every month except August. A budget setting meeting is held on the Tuesday following the 2nd Monday of January each year. Members of the public are welcome to attend all council meetings. A Town Assembly is held at the Civic Hall each year on the Tuesday following the 3rd Monday in March. Rooms at the Town Hall can be hired – please call for details. Also see the index of community buildings suitable for meetings, events, etc. Obituary: Claude Harlington, Town Clerk 1974-1999. Leaflets on a variety of local interests are available including Footpaths of Bollington, Historical note of Bollington, Postcards, Map & Street Index of Bollington and ‘Welcome to Bollington‘ which gives a list of the main services in the town. Drop in and help yourself! Internet service is available – first hour free! They have an excellent collection of local studies documents; ideal for looking into the history of Bollington, its mills and cotton industry, and the families that made the town what it is today. Virtual library – a complete online catalogue of more than a million books, CDs and videos held in 38 Cheshire libraries including Macclesfield. Registered users can also see their loans to check when items are due back. An online renewals and reservations service has also been provided. The library service is provided by Cheshire East Council. The Library Writing Group meet here. Children’s Rhyme Time is held on Friday mornings, from 10.00am, with fun musical session, games and other activities. All young children and their families are invited to drop in. Please phone 01625−573058 or call in for more information. For current opening times please see the web page. Call the Bridgend Centre for full details of all of these – contact details above. 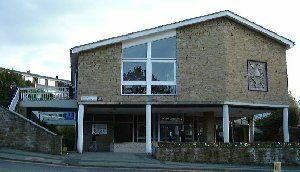 Societies using the Centre include: Bollington Civic Society and the Horticultural Society. The Centre can be hired for meetings and private parties. Substantial modern kitchen available for catering purposes. Family parties, weddings, christenings, children’s parties, coming of age, anniversaries, workshops, training and seminars, business and social meetings, and lectures. An index of community buildings suitable for meetings, events, etc. Monday to Friday 9.00am to 4.00pm for the registration of births, marriages and deaths. Note that it is necessary to make an appointment to attend the Registrar. Councillors are noted elsewhere . Find your bin collection day here! Applications are available for inspection online on CEC’s planning portal . Please note that there is a strictly limited period during which comments can be made (in writing, including by email) and that all comments are added to the online record for public access. If you call or visit the planning department you will need to know the planning reference number for the relevant application. This is given on the application papers and also where the application is listed in the Macclesfield Express in the Public Notices section of the Classified Directory. Go to the CEC planning portal . Enter some identifying information for the application you are interested in and the list of available documents should appear. No need to fill every field. Be aware that document files, especially the drawings, can be very large and may take some time to download, even with broadband. Highways department are responsible for all aspects of roads and pavements including lighting. Report Highway faults here . Look here for forthcoming road works . Set the required date period and type Bollington into the search parameter. CEC are responsible for all aspects including drains, potholes, gritting, lamps, street cleaning, abandoned vehicles, anti-social behaviour, dog fouling, waste collection, recycling, litter, community safety, etc. All street based service requirements can be logged with Cheshire East Council on Fix My Street (see box, above). Cheshire East Council are a partner in the Cheshire Household Waste Management Strategy which is designing and implementing ways to minimise, recycle and compost the maximum possible to cut down the amount of waste sent to landfill. A newsletter, Partnership News, is available at the Library and this describes the principal aspects of the Strategy and gives an insight into the many schemes being implemented around the county. If you see fly tipping in Cheshire East you can report it on their website . Report litter and street cleaning issues on the Cheshire East website . Report abandoned vehicles on the Cheshire East website . The CEC web site gives you 24 hour access to the Council . CEC are responsible for all aspects including drains, potholes, gritting, lamps, street cleaning, anti-social behaviour, abandoned vehicles, fly-tipping, waste collection, dog fouling, recycling, litter, community safety, etc. The ambulance service operates from Macclesfield and will normally take sick or injured persons to Macclesfield District General Hospital Accident & Emergency department in Victoria Road, Macclesfield, or to one of several other hospitals in the wider district (up to 45 minutes travel time) if the injured person requires specialist attention. Cheshire Police serve the whole county of Cheshire. Please do not call these numbers for anything other than an emergency. Non-emergency calls can cost lives by delaying genuine emergency calls. Please do not call the police for matters that should properly be attended by other agencies such as Social Services. The nearest Police station to Bollington is at Brunswick Street, Macclesfield SK10 1HQ (next to Macclesfield Library). However, this station, though open and manned, is no longer used for handling public phone calls or arrests. These services are centralised. All phone calls to Cheshire Constabulary are automatically routed to the Constabulary call centre at Winsford. Persons arrested in Bollington and district are normally taken to Middlewich and, when necessary, detained there. These are centralised at Middlewich with all arrested persons from the Macclesfield Division (Macclesfield, Bollington, Poynton, Prestbury, Wilmslow, Congleton, Knutsford and as far as Crewe) being taken there. If you need to collect someone from the suite go to Chelford roundabout, take the road to Holmes Chapel, follow the signs to Middlewich, on reaching the outskirts of Middlewich turn left at the first roundabout into Pochin Way, Middlewich, CW10 0GY . The custody suite is 0.4 of a mile on the right. It is 19 miles from Macclesfield and takes approximately 45-60 minutes. The outer barrier will open automatically as you approach. Park on the left and walk to the pedestrian gate; ring the bell and wait to be asked who you are and what you want. If you are then admitted push the gate hard; it has a very strong spring on it! Press the bell button at the main entrance and wait for it to open. You will be met at the reception desk; just wait if it is unmanned (normal situation), someone will come out to you. The entire suite is under active CCTV surveillance, they know that you are there! Be aware that you might have to wait inside for a considerable time. Police enquiries can be lengthy. There are no catering facilities for visitors. There is a lavatory. Visitors can request to be let out in order to return later; go to the main door and press the bell button on the left. Ensure that the Custody Assistant who talks to you knows what you are planning on. If you are wondering why I know so much about the inside of the custody suite it is because I worked for the Police Authority for many years in a voluntary capacity. Well that’s a relief. Cheshire Constabulary web pages . Our local area . Crimestoppers: 0800 555 111 any time, anywhere. Anti Terrorist hotline: 0800 789 321 any time, anywhere. Use of mobile phones – each county and metropolitan area has its own emergency services and call handling centre. When you call 999 from a mobile phone the system will determine which area to route your call to by looking at the area number from which you are phoning. So, if you are in the 01625 area your call will go to Cheshire but if you are in the 0161 area it will go to Greater Manchester. This is fine until you make a call from near (a mile or more) to the boundary of the telephone areas because you may actually be in, say, Cheshire but your phone thinks it is in Manchester. You will then be routed to the wrong emergency centre. If your phone displays the area code please check that it is showing the same area that you are physically in otherwise the operator may not be able to find your location and then confusion and delay can result. Hill tops can be problematic in this respect. I have stood on White Nancy, six miles from the 0161 area, and my phone has linked up with an 0161 mast. If this happens try turning round and it is possible your phone will connect with a different mast in the right area. The NPT has been highly successful in reducing Bollington’s crime level, particularly anti-social behaviour. They have held walkabouts, regular surgeries and public meetings since April 2004. The approach has been to employ one Police Officer, one Police Community Support Officer (PCSO) and one Special Constable. Call the NPT team on 0845 458 6371 (message box). … are volunteer officers who support the police on a part time basis. If you would like to know more about this important community service please contact the Head of the Neighbourhood Policing Unit at Macclesfield Police Station, 0845 458 0000. Special Constables celebrated 185 years of service in October 2016! Neighbourhood Watch, once known as Homewatch. There are many groups in Bollington each with their own coordinator. If you would like to know if you live in a Neighbourhood Watch area or would like to join your local group or start a group in your area then please call 0800 458 0000 and ask for the Neighbourhood Watch co-ordinator. The Cheshire Police & Crime Commissioner is an elected office. He/she is responsible for holding the Chief Constable to account on behalf of the people of Cheshire. Note that Cheshire Police cover the whole county of Cheshire, including Cheshire East and Cheshire West & Chester. East Anglian Ambulance Service have launched a national “In Case of Emergency (ICE)” campaign with the support of Falklands war hero Simon Weston. The idea is that you store the word “ICE” in your mobile phone address book, and against it enter the number of the person you would want to be contacted “In Case of Emergency”. In an emergency situation ambulance and hospital staff will then be able to quickly find out who your next of kin are and be able to contact them. It’s so simple – everyone can do it. So please do it now! It really could save your life! Note that Cheshire Fire & Rescue Service cover the whole county of Cheshire, including Cheshire East and Cheshire West & Chester. Bollington has a ‘retained’ fire service based in Albert Road and so the station is not continuously manned, nor even during business hours. Cheshire Fire & Rescue Service can provide Home Fire Safety Checks including survey and installation of smoke alarms, all free of charge. For further advice call 0800 389 0053. The electricity supply in Bollington is managed by Electricity Northwest. Water supply and the sewerage service in Bollington are managed by United Utilities. To report leaks in the garden, road or footpaths: 0800 330033. Leaks within the home are not the responsibility of United Utilities. You will need to call a plumber. The sewer from your house to the main pipe in the street is usually your responsibility. If part of that sewer is shared by two or more properties, then the shared part is the reponsibility of United Utilities. The main sewer in the street is the reponsibility of United Utilities. Bollington busses and bus stops have been upgraded to enable push chairs and wheel chairs to get on and off without difficulty. Train services are available at Macclesfield (intercity), Prestbury and Adlington. These stations provide direct access to Stockport and Manchester Piccadilly to the north and Stoke on Trent, Birmingham and London Euston to the south. Bollington no longer has its own rail station – the track bed is today the Middlewood Way. The Train Line – railway timetable internet pages, or for a cheaper option for purchasing tickets use the individual train companies’ web sites. Beware! The ticket machines at Macclesfield station issue tickets that may only be valid on certain trains!! If in doubt, buy your ticket at the counter and clarify which trains you can travel on. There are no banks or building societies in Bollington. Many have branches in Macclesfield. See below for cash availability. Some banking services are available at the Post Office in West Bollington. Cash can also be drawn from most current accounts at the Post Office in West Bollington. Cash can be drawn from most accounts at the ATMs outside the entrance to the Tesco store at Hibel Road, Macclesfield, available 24hrs, 7 days a week. The supermarkets and several other shops in Bollington, as well as several pubs, provide a cash-back service.